Looking for a new way to upgrade your home decor? In that case, we have ten amazing ideas to share with you. All of these are inspired by geometry, so you can choose your favorite shape and make your new home decor with it. Even though most of the projects on this list are diamond-shaped, that doesn’t mean you can let yourself to experiment more! 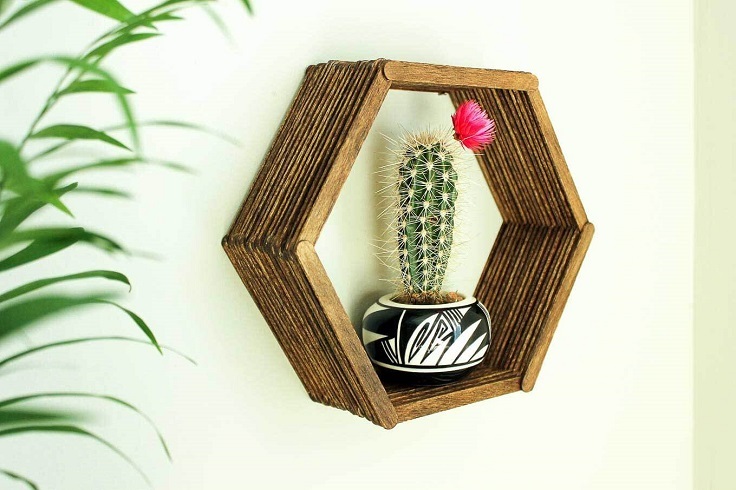 From planters to candle holders, these ten projects are easy to create and don’t require too many materials that will empty your pocket. It’s up to you to choose your favorite and to DIY! For this project you need ruler, wire, wirecutters, marker and needlenose pliers. You can make it with straws or brass and depending on your choise, you will need cocktail straws and scissors for the straw version, or 1/8″ brass tubing, tube cutter and pliers for the other one. Either way you will have an amazing home decor! 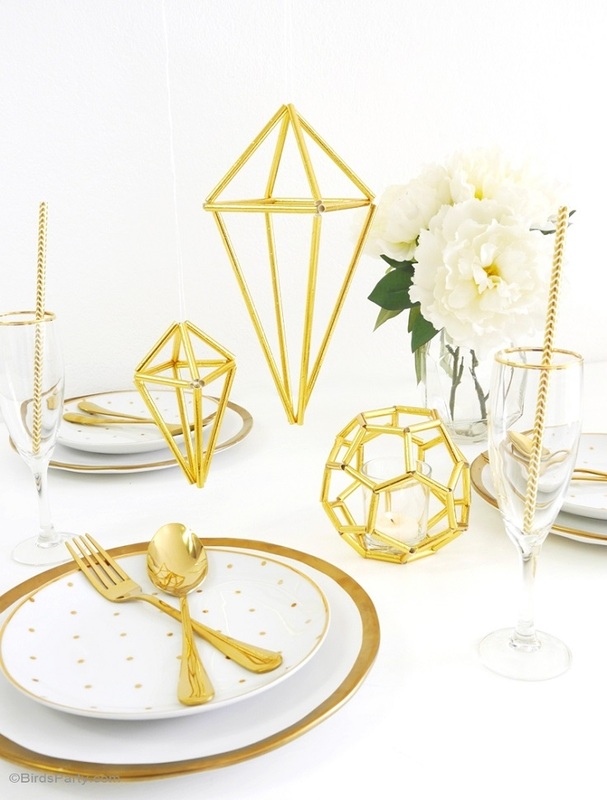 Feeling like you need to upgrade your party decor a little bit? In that case get some inspiration from geometry – these straws can be turned into great table decor and look as classy as an expensive, store-bought product. To make your own party decor such as this one, you need gold foil paper straws, thin gold craft wire, wire cutters, scissors and string or twine for hanging. 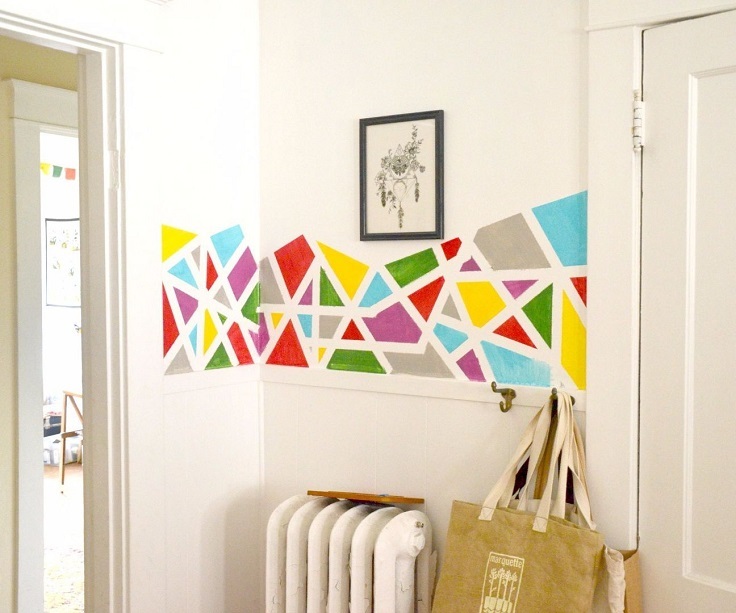 Perfect for any room, the geometric wall art can do wonders for your walls! If they’re white, you can go for a colorful option that will not only add color, but it will make the room more playful and vibrant. This is a really easy project, as all you need to do is to use painter’s tape, acrylic paint and after you’re satisfied with your work, let it dry and that’s it! If you’re the kind of person who loves having candles around the house, then you know how annoying is when the wax gets down on tables. Candle holders are a good way to spare yourself for cleaning, so making your own is always a possibility – especially when they look this adorable! 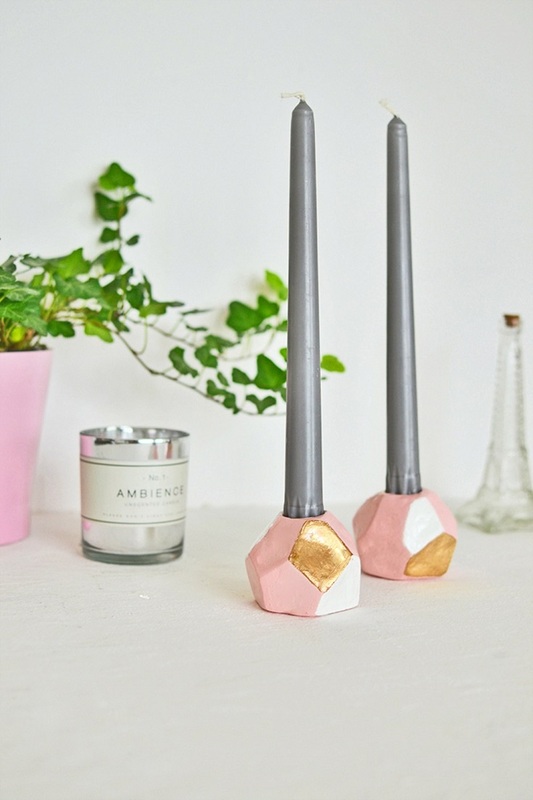 You need clay (1.1 lb), cutter, gold gilding, candle stick, brush, masking tape and pale pink spray paint. These geometric bowls are perfect for storing keys, notes or similar tiny stuff that you want to keep in one place to not get them lost. It’s very simple project and won’t empty your pocket, as all you need are just four materials – scrapbook paper, scissors, glue and folding template, that you can download for free from the website below the picture. Having plants in your home is a wonderful thing if you take care of them. But, caring doesn’t stop just with watering, it can also mean picking the right planter for your beloved plant. 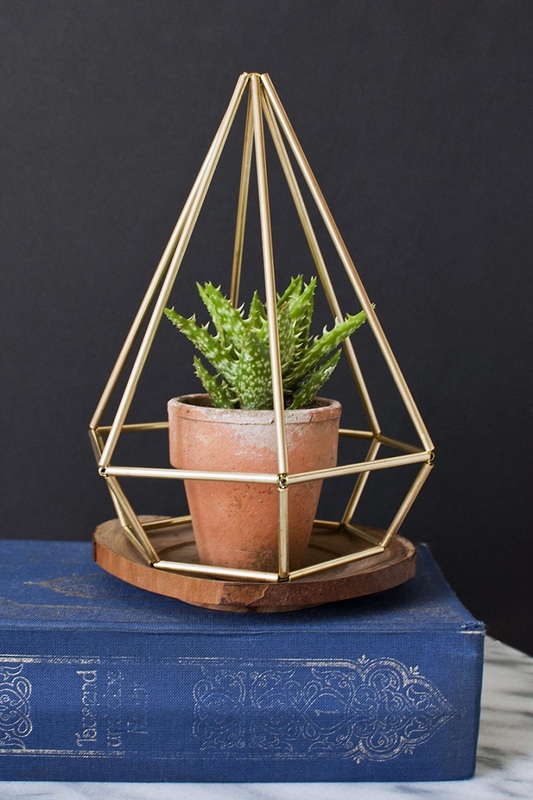 For example, you can create your own diamond-shaped planter that will not only serve its purpose, but it will be a great home decor. 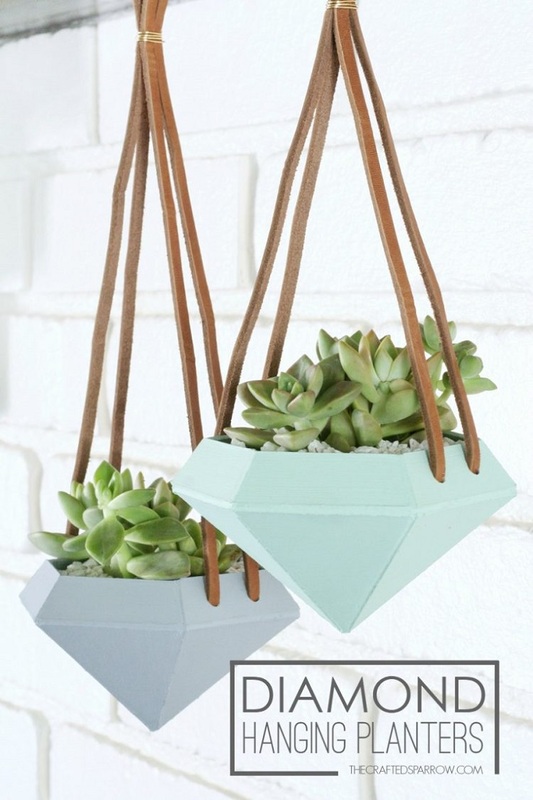 To make it, you need Cricut Explore Air, cutting mat, deep cut blade, chipboard, 50pt glue gun or quick dry glue, acrylic paint, sea foam brushes, leather cording, light masking tape, wire, succulents (live or artificial), small plastic container of soil if using live succulents and small white gravel. 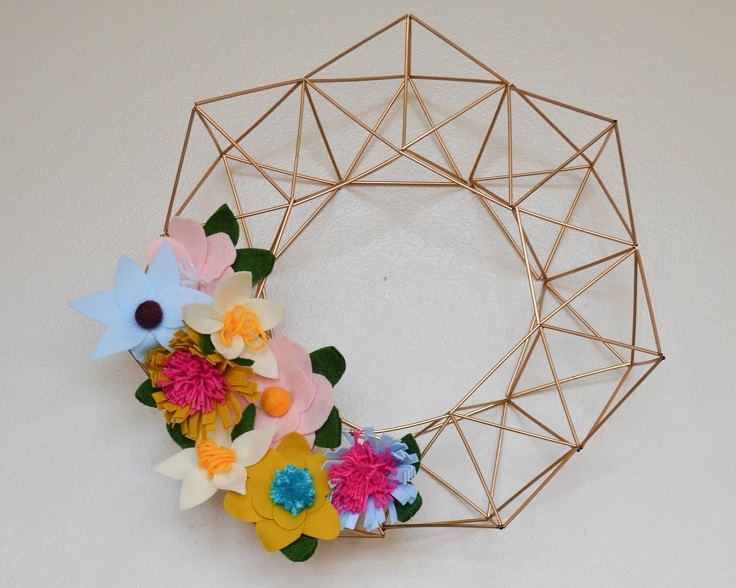 Spring isn’t that far away, so you can start searching for your next door wreath. We already found our favorite, so we would like to share it with you. It’s the perfect combination of geometry and felt flowers! You need 1 box of coffee stirrers, 30 gauge floral wire, 1 can of gold spray paint, floral stem wire, assorted yarn, assorted felt, wool roving or felt balls, scissors, glue gun, ruler and rotary cutter. So far we had so many diamond-shaped project, so it’s about time to change a little bit and move to triangles. 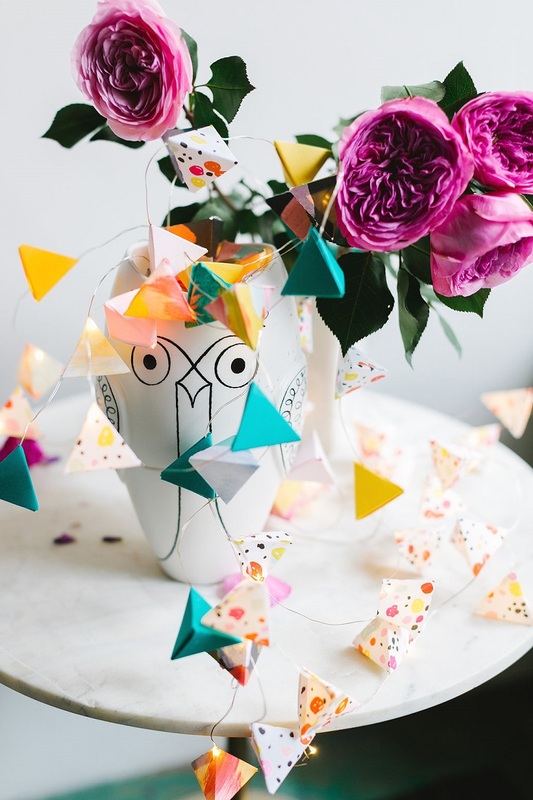 With these shape you can make amazing string lights that later you can hang like garland. First, make sure that you have the following materials: Fiskars 3-D Triangle Lever Punch or similar, paper (here are used both gift wrap paper and cardstock), glue or tape strips and LED String lights. Here’s another project that will help you with storing stuff. 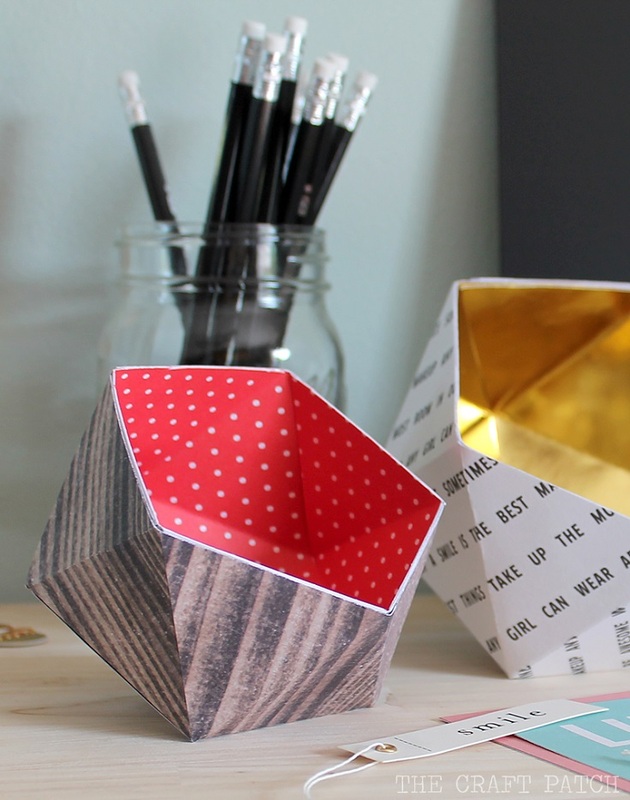 These cute wooden boxed can be such an amazing gift idea for someone who loves decor inspired by geometry. 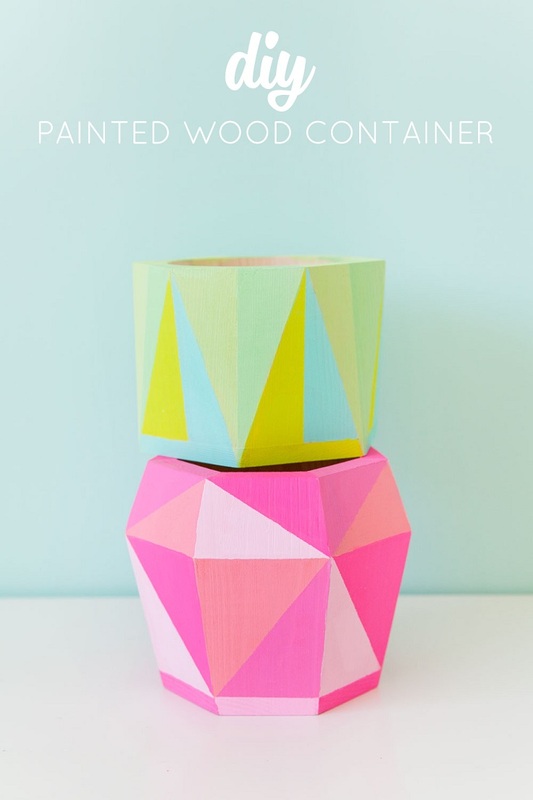 These are really easy to create, as all you need are wooden boxes and paint them in colors by your preference. Using patterning tape can help you while painting. And last, we have a hexagon-shaped project made out of popsicle sticks! Next time instead of throwing them away, save them for later and reuse them to create this amazing shelf. Besides the popsicle sticks, you also need tacky glue, Minxwas stain, paintbrush, hexagon shelf template and picture hanger, which is optional.